Dang. I didn’t get a chance to go to Universal Studios in Japan this year. Not that I was really planning on it, but after seeing this little horror nugget that they’re selling exclusively over there, it felt like the right thing to say. 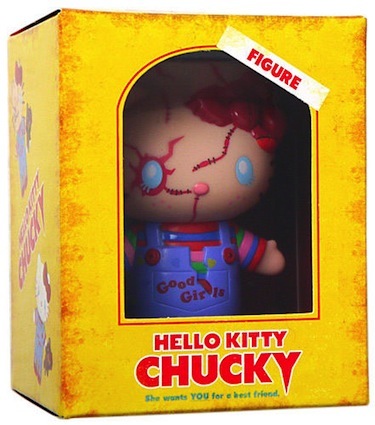 Feast your eyes on the Hello Kitty/Chucky hybrid vinyl figure! How adorable! Fun for all ages I’m sure. I do have to admit that I kind of want one, and I’m not too confident that Universal Studios in Hollywood is going to be getting them anytime soon. So what does that mean? You go to Ebay and pay 5 times the price of course! Just know that this figure is pretty small, so try not to shell out too much dough for it. To ship from Japan, I would say $40-60 total is a decent price. You can get one for $54 right HERE that includes shipping. Domo Ariagto!